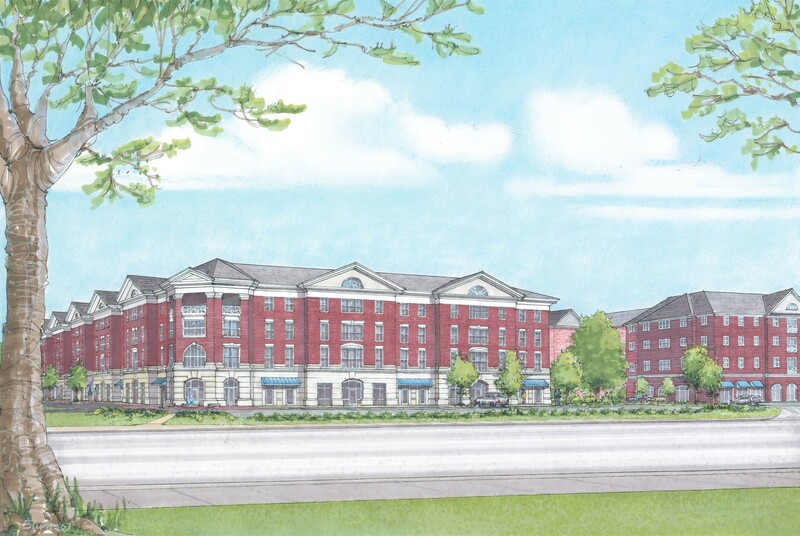 GLAVÉ & HOLMES ARCHITECTURE (G&HA) studied the design and feasibility of a mixed-use development to support Christopher Newport University (CNU). Located on Warwick Boulevard, the development site is immediately north and adjacent to CNU Village, which is a similarly-functioning CNU Foundation property. The proposed scope is 200 student apartment units, parking for 200, and approximately 25,000 square feet of retail lease or office space. The retail and office space is located on Level 1, with parking on floors 1, 2, and 3 to support the apartments on Levels 3 and 4. The building is sited on a prominent corner, and two façades are particularly visible from the highly trafficked roadway. The design challenge was to use common architectural elements from the Great Lawn buildings to emphasize connection to campus, while “hiding” parking which occupies the entire second level.